Risk-averse enterprises finally accepted the cloud in 2017, and we didn’t even notice. 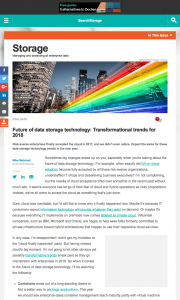 Expect the same for these data storage technology trends in the new year. 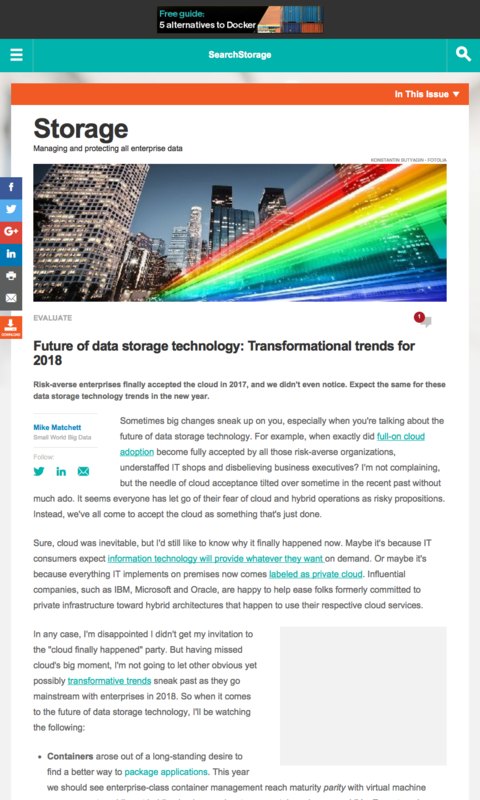 Sometimes big changes sneak up on you, especially when you’re talking about the future of data storage technology. For example, when exactly did full-on cloud adoption become fully accepted by all those risk-averse organizations, understaffed IT shops and disbelieving business executives? I’m not complaining, but the needle of cloud acceptance tilted over sometime in the recent past without much ado. It seems everyone has let go of their fear of cloud and hybrid operations as risky propositions. Instead, we’ve all come to accept the cloud as something that’s just done. Sure, cloud was inevitable, but I’d still like to know why it finally happened now. Maybe it’s because IT consumers expect information technology will provide whatever they want on demand. Or maybe it’s because everything IT implements on premises now comes labeled as private cloud. Influential companies, such as IBM, Microsoft and Oracle, are happy to help ease folks formerly committed to private infrastructure toward hybrid architectures that happen to use their respective cloud services. Containers arose out of a long-standing desire to find a better way to package applications. This year we should see enterprise-class container management reach maturity parity with virtual machine management — while not holding back any advantages containers have over VMs. Expect modern software-defined resources, such as storage, to be delivered mostly in containerized form. When combined with dynamic operational APIs, these resources will deliver highly flexible programmable infrastructures. This approach should enable vendors to package applications and their required infrastructure as units that can be redeployed — that is, blueprinted or specified in editable and versionable manifest files — enabling full environment and even data center-level cloud provisioning. Being able to deploy a data center on demand could completely transform disaster recovery, to name one use case. Everyone is talking about AI, but it is machine learning that’s slowly permeating through just about every facet of IT management. Although there’s a lot of hype, it’s worth figuring out how and where carefully applied machine learning could add significant value. Most machine learning is conceptually made up of advanced forms of pattern recognition. So think about where using the technology to automatically identify complex patterns would reduce time and effort. We expect the increasing availability of machine learning algorithms to give rise to new storage management processes. These algorithms can produce storage management processes that can learn and adjust operations and settings to optimize workload services, quickly identify and fix the root causes of abnormalities, and broker storage infrastructure and manage large-scale data to minimize cost. The pace of change in IT is staggering. Fast growing data, cloud-scale processing and millions of new internet of things devices are driving us to find more efficient, reliable and scalable ways to keep up. Traditional application architectures are reaching their limits, and we’re scrambling to evaluate the best new approaches for development and deployment. Fortunately, the hottest prospect — containerization — promises to address many, if not all, of these otherwise overwhelming challenges. In containerized application design, each individual container hosts an isolatable, and separately scalable, processing component of a larger application web of containers. Unlike monolithic application processes of the past, large, containerized applications can consist of hundreds, if not thousands, of related containers. The apps support Agile design, development and deployment methodologies. They can scale readily in production and are ideally suited for hosting in distributed, and even hybrid, cloud infrastructure. Unfortunately, containers weren’t originally designed to implement full-stack applications or really any application that requires persistent data storage. The original idea for containers was to make it easy to create and deploy stateless microservice application layers on a large scale. Think of microservices as a form of highly agile middleware with conceptually no persistent data storage requirements to worry about. Because the container approach has delivered great agility, scalability, efficiency and cloud-readiness, and is lower-cost in many cases, people now want to use it for far more than microservices. Container architectures provide such a better way to build modern applications that we see many commercial software and systems vendors transitioning internal development to container form and even deploying them widely, often without explicit end-user or IT awareness. It’s a good bet that most Fortune 1000 companies already host third-party production IT applications in containers, especially inside appliances, converged approaches and purpose-built infrastructure. It’s a good bet that most Fortune 1000 companies already host third-party container applications within production IT. 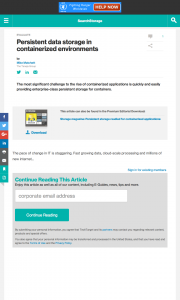 You might find large, containerized databases and even storage systems. Still, designing enterprise persistent storage for these applications is a challenge, as containers can come and go and migrate across distributed and hybrid infrastructure. Because data needs to be mastered, protected, regulated and governed, persistent data storage acts in many ways like an anchor, holding containers down and threatening to reduce many of their benefits. Have you figured out everything you need to know about managing and operating container environments already? How to host them in your production data centers at scale? 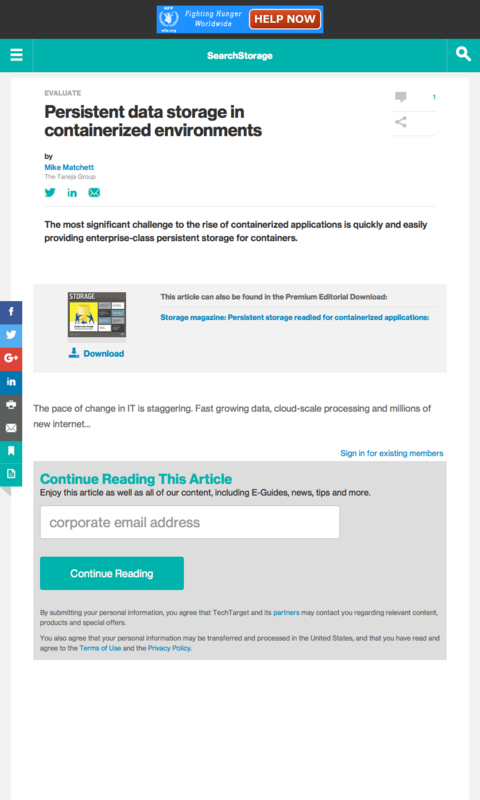 Transform all your legacy apps into containerized versions? Train your developers to do agile DevOps, and turn your IT admins into cloud brokers? Not quite yet? I hate to tell you, but the IT world is already moving past containers. 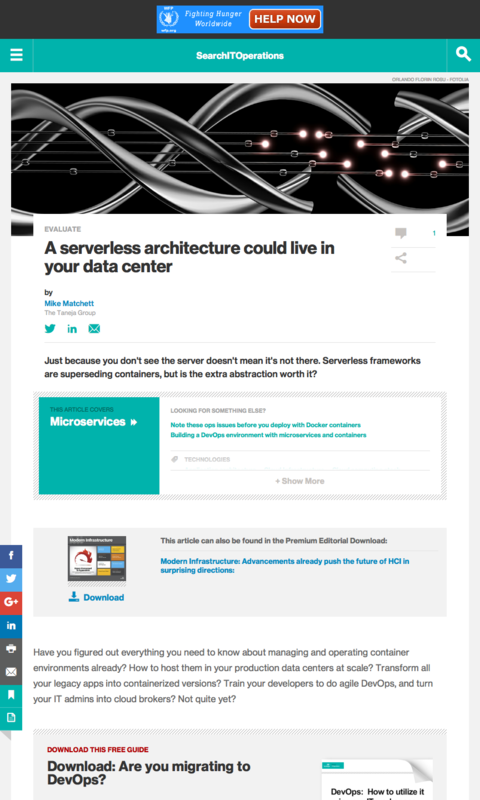 Now you need to look at the next big thing: serverless computing. I don’t know who thought it was a good idea to label this latest application architecture trend serverless computing. Code is useless, after all, unless it runs on a computer. There has to be a server in there somewhere. I guess the idea was to imply that when you submit application functionality for execution without caring about servers, it feels completely serverless. In cloud infrastructure as a service, you don’t have to own or manage your own physical infrastructure. With cloud serverless architecture, you also don’t have to care about virtual machines, operating systems or even containers. 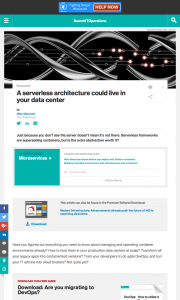 Serving more through serverless architecture? So what is serverless computing? It’s a service in which a programmer can write relatively contained bits of code and then directly deploy them as standalone, function-sized microservices. You can easily set up these microservices to execute on a serverless computing framework, triggering or scheduling them by policy in response to supported events or API calls. A serverless framework is designed to scale well with inherently stateless microservices — unlike today’s containers, which can host stateful computing as well as stateless code. You might use serverless functions to tackle applications that need highly elastic, event-driven execution or when you create a pipeline of arbitrary functionality to transform raw input into polished output. This event-pipeline concept meshes well with expected processing needs related to the internet of things. It could also prove useful with applications running in a real-time data stream.